We offer comprehensive security services in the form of door security guards, armed personal body guards, female security guards, personal security officer, escorts, bouncers etc and all these are highly trained for providing optimum security to the clients. If being a female business person you are worried for your personal security then, hire trained female security guards of Secura Security. All our bouncer security and corporate Security Guard are well trained to handle weapons that are licensed and we also provide them training to handle all the security equipments like Door Frame Metal Detector, Hand Held Metal Detector etc through which they can ensure the pure security of clients along with their assets. The training provided by our experts to female security guards is changed from all other security companies. So, those who are in need to hire trained female security guard in Delhi can contact us without thinking more as we trained all of our security guards with a proper plan. Being one of the prominent security service providers, we are engaged in offering male/female security guard to our valued clients. We train our ladies security guards with latest security techniques and procedures to offer best security services to our clients. 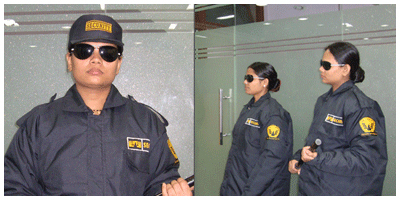 So, Secura Security is the best place from where you can hire trained female security guards.